Tools: The OWC Internal SSD DIY Kit (photo courtesy of OWC). 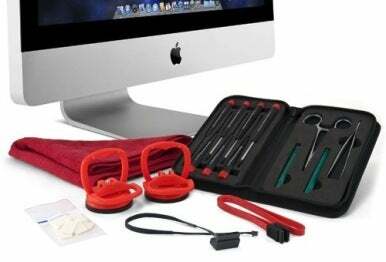 The process of dismantling an iMac is riddled with difficult tasks from start to finish, and each step requires a fair amount of caution and precision. In the first two steps, you must remove the glass screen cover by using the two suction cups provided in OWC’s kit. After gently detaching the glass, you then remove eight screws that hold the screen in place, making sure to not touch the screen itself, as the oils from your hands are extremely difficult to wipe off the screen. Once you have removed the screen and placed it on a static-free surface, you will then be instructed to remove the internal fan, AirPort card, optical drive, and even the logic board. All in all, this requires you to remove 13 more screws and disconnect a handful of cables inside the iMac. When all of the tems have been properly removed and disconnected, you can place the SSD against the back wall of the iMac directly underneath the location of the optical drive. Afteer the new SSD has been connected properly, you retrace your steps until you have your iMac put back together. From start to finish, placing the new SSD in our iMac took approximately two hours to complete. To gauge the speed improvement, we first ran our Speedmark 7 series of benchmark tests on a stock 21.5-inch 2011 iMac with a 2.7GHz Core i5 quad-core processor, 4GB of RAM and a 1TB hard drive, running Lion 10.7.3. After installing the SSD behind the optical drive, we selected it as the boot drive and put the system through the Speedmark tests again. 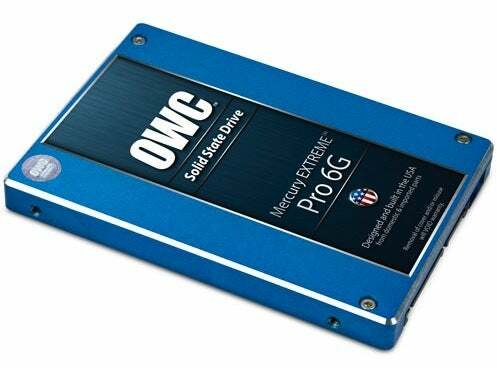 Upgrade: OWC's Mercury Extreme Pro 6G SSD (photo courtesy of OWC). The iMac’s benchmarks were similar to the results with the SSD installed internally, with the exception of one test—the large file Zip test, which took nearly twice as long when the SSD was attached via Thunderbolt. Other tests results that were faster with an internal SSD than with the stock 1TB hard drive maintained their speed advantage when the SSD was attached externally. The benefit here is that the SSD is much easier to connect to your Mac and is accessible if you want to use it with another machine. Speedmark 7 result is a score; higher is better. Other test results in the table above are in seconds; lower is better. Reference setup in italics. Best result in bold. Test results in the table above are in seconds; lower is better. Reference setup in italics. Best result in bold. MathematicaMark 8 result is a score; higher is better. All other test results in the table above are in seconds; lower is better. Reference setup in italics. Best result in bold. Results are in fames per second; higher is better. Reference setup in italics. Best result in bold.